Interests:Scottish militaria 1881-1939 and the men who owned the artifacts. A recent acquisition of a Great War Balmoral bonnet worn by an officer of the Argyll & Sutherland Highlanders (see 1st picture set) has inspired me to do a brief comparison study with historical notes of the Balmoral with its counterpart, the Tam O’Shanter, seen in the 2nd picture set. This latter bonnet is an officer’s example from The Black Watch. I realize that this topic has undergone previous discussion on the GWF most pointedly here where the late Joe Sweeney made a significant contribution. Nonetheless, I believe that there are a few more salient points to be made in furtherance of these earlier discussions. Both of these bonnets were introduced for the Scottish line infantry in 1915 to afford better protection to soldiers in the trenches from wet weather and sun. The glengarry had been inadequate in this regard. Joe Sweeney, in the previously noted thread, provided these dates of introduction: blue balmorals pattern sealed March 1915 and drab Balmorals in May with issues beginning Feb 1915; Tams pattern sealed May 1915 with issues likely beginning early summer. These round bonnets were hardly unknown to the Scottish regiments before the Great War. The round hummel bonnet was worn from at least the early 19th century morphing into the feather bonnet. Just prior to the Great War a diced Balmoral was worn by the 6th Battalion Highland Light Infantry (TF). The Lovat Scouts had a blue-white diced Balmoral, and the Scottish Horse wore a red-white-green diced Balmoral. About 1900 the Royal Scots and King’s Own Scottish Borderers adopted the Kilmarnock bonnet, a Balmoral with a crown stiffener, as the full dress headdress. Now on to the actual comparisons of the two aforementioned examples. Balmorals and Tam O’Shanters differed essentially in four characteristics, the last one being most important: 1) Diameter – The crowns of both bonnets are ellipses and are longer front to back. The long axis of the Balmoral is 10.5 inches in diameter, the short axis 9 inches. The long axis of the officer’s Tam is 11.5 inches, short axis 10 inches. The OR Tams are larger with long axis 12 inches and short axis 11 inches. This is not an especially significant aspect inasmuch as Tams were later manufactured with smaller crowns. 2) Headband – The Balmoral’s headband is composed of silk for officers and the OR version used lower quality grosgrain material. The Tam’s headband is of the same drab wool as the rest of the bonnet. 3) Closure at headband back seam – The Balmoral has two ribbons or tails attached to each side of the seam. These were usually tied into a bow and allowed some adjustment to the circumference. The closure mechanism on the Tam was a simple piece of burlap cord tied through two eyelets and afforded limited ability to adjust circumference. 4) Structure and manufacturing – The body (crown and sidewalls) of the Balmoral is a single piece. This required each copy to be separately knit, wet shaped, and then integrated with the other pieces. This was a fairly complicated manufacturing process. In contrast, the body of the Tam consists of two separate pieces, the crown and the sidewalls. This allowed these two pieces to be cut in bulk from pre-fabricated wool cloth and then sewn together to construct each copy. The seam binding the crown with the sidewall is quite evident in the second picture set. This was a considerably simpler (and cheaper) manufacturing process thus explaining why the Tam displaced the Balmoral as the primary headdress for the Scottish line infantry during the Great War. This last point is the most significant difference between these two bonnets. Going forward in time after the Great War, the Scottish line infantry retained the Tam O’Shanter for wear with Service Dress, the glengarry being reserved for ceremonial occasions. The Tam continued in service with Battledress through WW2, was used with post-war non-ceremonial Number 2 dress, and is still worn with combat dress today. Throughout this timeline, the diameter of the bonnet was progressively reduced. The blue Balmoral, with dicing and hackles in some regiments, was re-adopted in the early 1950s and worn until 1962 when supplanted by the glengarry. The Lowland regiments had tails on their Balmorals while the Highland regiments did not. The Royal Scots Fusiliers reverted to the glengarry in 1954 while The Black Watch retained the “Blue Bonnet” with their distinctive red hackle until 2006. 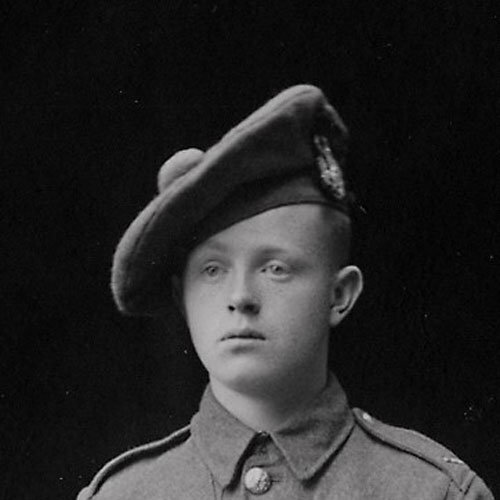 The Cameronians and Camerons had worn black and blue hackles respectively behind the cap badges in their Balmorals. I hope this little explanatory note is of interest to some of our members. Of course, feedback on error corrections, omissions, or additional information is welcome. Further, please post any photos of examples from your collections or interesting period photographs concerning these two styles of headdress if you are so inclined. The evolution of the Tam over the years is very interesting to me: in 1978 I was issued with a vile, rough, khaki Tam, quite small in diameter. The first thing pretty well everyone did was buy a tailored ToS from the Gordon QPSI (£2.50!). This was a much smarter object, and had high sides and rear, with the brim pulled down over the eyes. Indeed, we ironed the crown (even starched it) to create a very definite 'peak' to the thing. I notice now that the issue Tam is almost the size of a beret with a bobble on top. I should imagine that your rough 1978 Tam was comparable in material quality to the issue quality of Great War Tams. The 2 ORs examples in my collection are a very rough wool. Interesting how military fashion has changed. 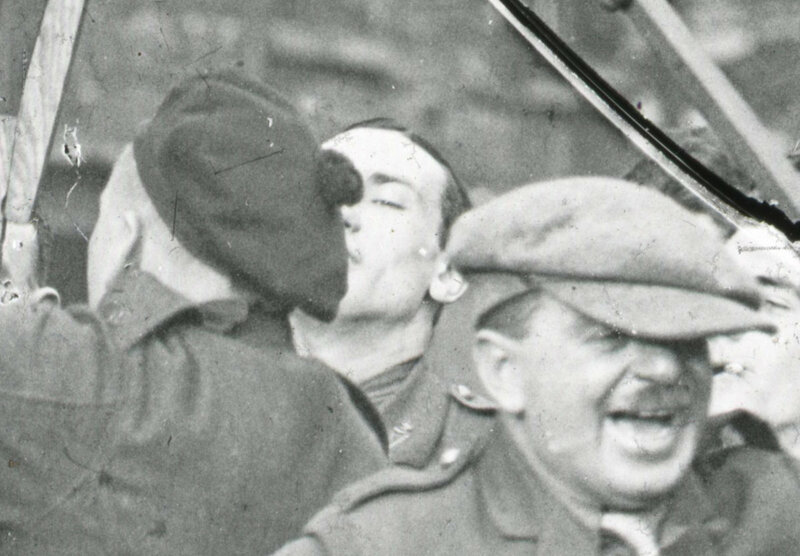 For WW1 most soldiers preferred the"pancake" look transitioning through several fashion generations to the look you described with the brim pulled over the eyes. I had no idea that berets are that big. Did you really mean that berets exceed the size of WW1 Tams? The beret is essentially an unshaped Balmoral. No: the Tams have become rather small. (Much the same as policemen). I'll try and get a photo of one for you. OK, I now see that you were referring to contemporary Tams. I had the honour of serving in 204 (V) (Tyneside Scottish) Field Battery. We wore TOS with the Black Watch hackle as ORs and Balmorals as officers. On one exercise we arrived as a FOO party with the KOSBs. There was a lot of distrust as their artillery support appeared to be disguised as a regiment they had an ancient enmity with! We slipped on Gunner berets and it was all good. the Balmoral is an excellent headdress and I was very sad when I left the battery as I never quite "got on" with berets, even a Victor or a Du Brora model. Many thanks for this interesting anecdote. Could you elaborate on the origin of the enmity between the KOSB and your regiment? 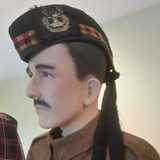 Joe Sweeney published an excellent article in a French militaria magazine comparing the various styles of scottish headdress from the Great War period - well worth seeking out. At one point I collected together a fairly broad selection of images of the differerent styles of headdress and the various affectations in wearing them - once the term is done (1 week) I might be able to dig some out and post them if they would be of interest. I harvested this image from Pinterest some time ago, which I assume is from an Osprey volume, but have never identified which. Does anyone recognise it? The chap bottom left in the flak jacket & DPM has a 1970's Ulster look about him, so clearly it covers a broader timeframe than just the Great War. The changes to the sizes and shapes of the balmorals and Tams are quite well shown, but without its key, the Plate is less useful. Thank you for this Mike - looking through some photographs I can clearly see the stitched seam in some of them. Is this what you mean by 'pancake'? An interesting and informative write up, thanks especially explaining about the constructional differences between the two. 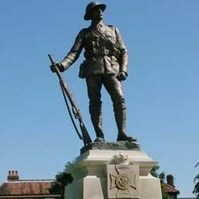 Interests:1914: 5th Signals Coy, RE and 1915: 1/23 Londons; 2 Royal Fusiliers; 1st Field Sqdn RE. Le Cateau, Givenchy, Gallipoli, PoWs. HMS Caradoc. KOSB, Scottish Rifles. Lanarkshire Yeomanry. I agree with Jerry - many thanks, a very helpful and instructive thread. Spurred on by this topic, I dug deeper to find the plate I posted above. I was justified in thinking Osprey, as it is definitely Mike Chappell, but it is actually from Book 2 of his series The British Soldier in the 20th Century subtitled Field Service Head Dress 1902 to Present Day and published by Wessex, not Osprey. I have also found a key to the plate in this topic on the GMIC, which covers similar ground to our topic here. I've ADDED the key next to the plate above. Chris....Yes, I remember mention of the Joe Sweeney article. I could never figure out how to obtain it. Do you have access to this article? Please do post those headdress images. Mark.....A very useful image. I had seen the plate before but not the key. Thanks for posting this. Neill....Appreciate the link to your Dandy Ninth page. The newspaper clip image of the Black Watch soldier is indeed an example of the "pancake" look. Most soldiers found a way to stiffen the left side of the bonnet so the pancake is tilted off to the wearer's right. There were a couple of ways to do this. One approach was to position the metal badge over the junction of the headband and sidewall thus propping up the left side; equivalently, the root of the Black Watch's red hackle could be inserted into the headband to give the same effect. 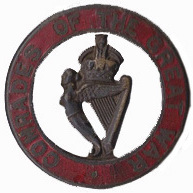 Some soldiers found it more aesthetic to place the cap badge entirely on the sidewall of the bonnet; in this case the stiffening was achieved by inserting a thin piece of wood about 2 inches in length inside the bonnet underneath the badge's cotter pin also spanning the junction of the headband and sidewall. See image below of a Gordon OR's TOS that I own where this latter technique is used. Of course some soldiers did not bother with either technique, such as the fellow in your newspaper phoro, allowing the TOS to flop over on both the left and right creating a symmetric look. Thank you for the feedback, Gentlemen. I would observe that there's not a smarter form of military headdress anywhere. I have glass plate images of Auxiliary RIC in Ireland wearing tams circa 1921 for comparison. Not sure if they're in scope for the forum though. If someone can confirm I'll put them up. I cant! It was something between BW and KOSB, though I suspect local contemporary and territorial rather than historical? So not about who let who down in some battle but who claimed rights over a bar in Horne or Paderborn?? Indeed, and it was smarter before the crowns were so radically narrowed. Please do post these. I would be interested in seeing them. The bar issue would be a very serious matter. OK. In the interest of quantifying the extent of reuse of WWI uniforms in the Auxiliary RIC, and the fact these are 1921 vintage so within CWGC timeframe, here we go... If mods decide that it isn't appropriate feel free to move elsewhere. Credit: South Dublin Libraries. Permission to reuse for education and research only. Here's a relatively random selection - but with lots of Gordons. The odd South African and Canadian too perhaps. Showing styles, affectations in wear and also covers. And a couple like the first one because I just like them! I will look out the reference to the article. Great photos all the same! oops! I scanned the plates myself and thought I'd nailed the glossy vs matt side to get them correctly orientated. There was another similarly inverted one that was pointed out to me by another forum pal in the RIC area. Thanks for pointing that out Mark.